That’s right, an honest-to-God black truffle, sourced from somewhere in NSW and provided to the Pricks courtesy of very generous commenter and friend of the site Dr Duck, just proving that Prick With a Fork readers are the greatest, smartest, loveliest blog readers in the world. It’s every bit as redolent as you would expect, and more: Even after just a 25-minute drive home, the Prickmobile is now infused with the aroma of truffle, which beats even new car smell in my book. 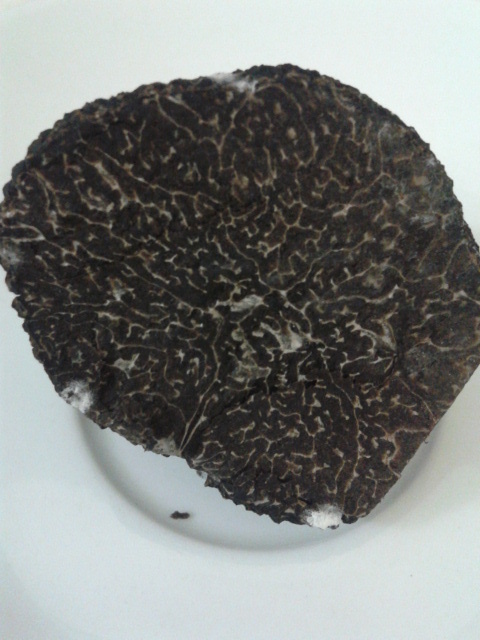 The only question is, what to do with it (besides kick myself for not picking up that gorgeous truffle slicer we almost bought in Sarlat a couple of years ago)? It’s gone in a container with the carnaroli and a few eggs, and I’m thinking something simple, shaved over some beautiful egg pasta, perhaps with one of those aforementioned eggs cracked over. Anyone else got a bright idea or three? Precocious kid-friendly dishes especially appreciated. Much thanks to the generous donor, and we will have all the fun with this it deserves. Thanks for the kind word, Mr Prick, it is my pleasure. Simple is best, and truffle has a definite affinity to eggs, cream and butter, so the idea of egg pasta with butter and a barely warmed egg (infused with the truffle) is a very good one. I’m having a few good friends over on Saturday for a truffle inspired dinner, and am thinking of starting with a potato and rosemary pizza with truffle as an appetizer, a duck raviolo, seasoned with truffle, in a duck stock reduction for the entree, simple steak (probably a scotch fillet) with truffle butter and a salad for main, and finishing with a King Island Triple Brie that I have cut into layers and filled up with fine truffle shavings. This is really good when the cheese is properly ripe. I’ve made truffle vodka by infusing truffle slices into good vodka, and we will probably have a nip or two of that with the pizza, followed by carefully selected wines to match the intense aromatic character of the truffles. You need suitably big wines, as delicate ones will get overwhelmed. In my opinion, funky wines with wild yeast ferments go well. Er, what’s that address again, Doc? O M G I am so jealous! Love this blog, thanks for the entertainment and foodie ideas. There’s some ideas – all were extraordinary!